We don't know what leads Judas to betray Jesus, but we know it stemmed from Satan entering him (22:3). Judas was one of the twelve and was around Jesus everyday, listening to his teaching, seeing his miracles and hearing God's word and yet the devil still got a foothold (Ephesians 4:27). The enemy prowls looking for any way to get in. Judas had all the resources and the presence of Jesus available to him but he did not enter into a relationship with him. From the outside he looked like one of the twelve but he had not accepted Jesus in his heart. Jesus knew that Judas would betray him but he doesn't confront him or throw him out of the inner circle. He reclines at the table with all of them for the last supper, he says "I have eagerly desired to eat with you" (22:15). He acknowledges his betrayer is at the table but does not identify him, he shares the last supper with them all equally. In the same setting he acknowledges Peter's denial, encouraging him that he is praying over him for protection from the enemy, knowing that he will come back to him. Satan had asked for all of the disciples to be given over to him, Jesus tells Peter he had prayed for him specifically and he still intercedes for us in the same way (Romans 8:34). Jesus gives us a challenging example as he prays for others even as they persecute, betray and deny him. The security and protection that being in relationship gives us, strengthens our faith as we seek to support and pray for those who we may feel don't deserve it. As Jesus is hoisted on the cross and the soldiers squabble over his belongings he prays forgiveness over them. Close to death and despite the pain he must have been in, Jesus still only consider others as he talks with the thief on the cross beside him and brings him into the Kingdom. It is never too late to come into a relationship with Jesus. He will protect you, pray over you and help you against your demons and addictions. 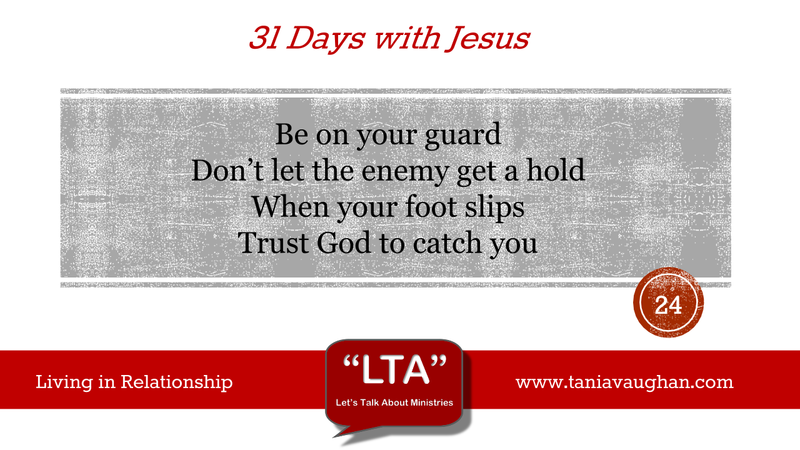 He gives you the resources to resist the enemy but you need to accept and use them in your life. You need to invite him in, talk to him in prayer and know him through his word. Before you pray read through Psalm 121 and reflect on how God watches over you and protects you. Lord, I thank you that even when I am far from you or I get it wrong you still sit with me and pray over me. Thank you that you watch my steps and can keep me from falling. Help me Lord to reach out and hold on to you in times of doubt and trouble. No matter how hard life is Lord, I want to always be able to reach out to others as you reach out to me. It amazing to see here JC acknowledges that his betrayer is in their midst. On discovering such a revelation I think we mortals would eject him and try to prevent the betrayal - imprisonment? physical violence? But not Jesus! He knows that this is the only way prophecy can be fulfilled and for his whole reason for becoming man in the first place. Instead jesus accepts it and forgives it. We also see the JC clarifying the strength of Peter's faith. 2 disciples letting him down even before he goes to be cruxified - I wonder how JC felt? What we can learn from this is that despite the closest of friends letting him down he forgave. Even at his last he forgave. We are called to be christ-like and that means forgiveness. Is there someone you need to forgive or there may be someone you need it ask forgiveness from?